Startup Escalation 1999 2000 2001 2002 2003 2004 2005 2006 2007 2008 2009 . This Year: Commentators Jan Feb Mar Apr May Jun Jul Aug Sep Oct Nov Dec .
Superhuman World 2008 is a work of fiction. The characters herein and the commentary about them should not be considered "real". Wyatt Ferguson is accused of sabotaging a NATO aviation program last October, so that Russians were able to take exclusive control of Earth orbit in November. Mr. Ferguson has actively cooperated with Russians since then, and subverted and defied international, national, state and local authorities who wish to question him. Mr. Ferguson is 46 years old, of superior intellect, physically fit for his age, possesses fighting skills, and also superhuman powers of flight and long-range transportation which are ideal for evasion. At various times he has been a self-professed "chaos mage" and performed sorcery. Thereby he may have any unexpected superhuman power at any given time. He has operated a corporation of engineering services, and has considerable financial resources. Superhuman heroes consider him a rogue operative. He is highly connected with superhuman villains, sorcerers, and Russian internationals, all of which communities are high-level threats to our current world situation. Mr. Ferguson is a United States of America citizen. His nation's government has interned or attempted to intern him on at least three occasions in the last two years. (January 2006, November 2006, March 2007) On each such occasion, Mr. Ferguson has used his connections and evasive skills to recover his rogue status. He has operated a web log underneath Hurriertech.com. (Deutsch: Eilertech.com.) His web log has been popular with the public, because it revealed secrets of the superhuman community. Most superhumans prefer this log be shut down. It is irony that my own business has leased that site to him. My business operates under the laws of the Federal Republic of Germany. After last year's international incidents, my nation's government declared Mr. Ferguson's web log to be a propaganda organ for foreign powers. As one may understand from Cold War history, this is of concern to the German government. By the terms of my contract with Mr. Ferguson I am legally advised to maintain access to his previous entries, but I am cooperating with my government to prevent new entries from him. I have offered my assistance to make Mr. Ferguson answer the accusations against him. This year's Superhuman World journals will contain my updates concerning the hunt for Wyatt Ferguson. All readers of the World Wide Web are encouraged to cooperate with this hunt. This web site has some minimal redesigns, but has been kept compatible with previous entries. On behalf of Hurriertech.com, I trust your enjoyment of the Superhuman World web site will continue. (signed) Erik Katzman, The Hurrier. Meet the Hurrier. Given this year's change in web site management, the readers of Superhuman World 2008 will of course wish to know more about who is telling this story. I am happy to oblige. I am named Erik Katzman, age 33. I am known internationally as The Hurrier, or "die Eiler" in German which is my native language. I am famous since 2003 for having the power of superhuman speed. Ironically, Wyatt Ferguson made me famous; he was the first journalist to write about my powers. I spent my youth near the Nuerburgring race track in the Rheinland of Germany, original home of the German Grand Prix. Perhaps this influenced my need for speed. I can run as fast as most aircraft, though it takes me some time to accelerate. I still prefer airplanes for transport, because that way I can still work. My main power is that I hurry. I hope to inspire others to treat life with urgency also. I work as a management consultant. Management loves speed, almost as much as I do. In my uniformed identity, they like to have me sponsor their initiatives. I also can make people hurry. Employers especially value that. 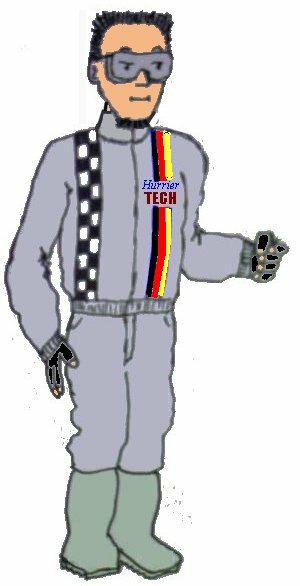 As a businessman, I sponsor Hurriertech.com. It is open to public use under reasonable licensing fees, with exemptions for charities including online forums and neighborhood associations. The source of my superhuman powers has been a mystery. In 2004, I investigated how they might have derived from the gods of the Greek Parthenon. Ironically, web journalists thought I was a mage. I then worked with the Church of the Super Savior while they helped me investigate other possibilities. In 2007, my government asked for my assistance in protecting an aviation project - the one which Wyatt Ferguson raided. I then worked with other superhumans when North America came under attack. The Captain Mighty gave his life to allow me to save one innocent. In his name I now continue this work, to defend the world. I am married to my little loved one Katerina, who also works with me in Hurriertech.com. She is but 22 years old, but most competent. We have thus far volunteered to limit world population overgrowth by not bearing our own children. I am pleased to meet you, and hope for a long association. There's been a plot to change the world forever - a successful plot. The "Panlucida" rock concert, a simultaneous trans-Atlantic performance in Ireland and Argentina, happened on Saturday 5 January. The Irish government requested European Union assistance to provide security for the Dublin stage. I assisted the German contingent there. There were some sorcerers assisting, including Mr. Finisterre John Loring from the United Kingdom. 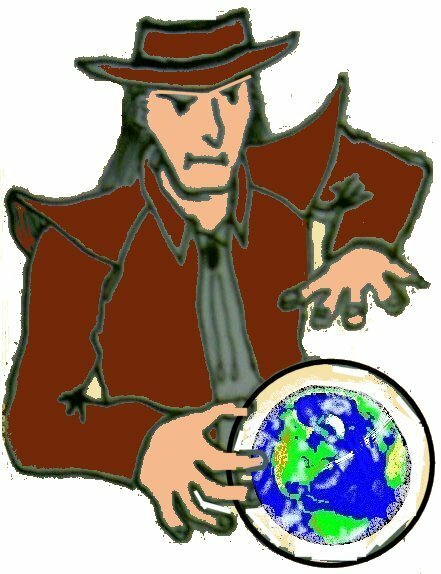 Since last year, responsible sorcerers assist governments. They said they had reason to expect interference from evil sorcerers. So they warded the arena. We had some time for conversation. Mr. Loring told me, The Haste of Jesus was once like a spirit on the road to Bethlehem, getting people to help Mary and Joseph hurry. That Haste might haved lived in several people through history, and in me now. I admit, this theory of my origins is as good as any other. Despite all precautions, magic forces were in evidence at the concert. The American female superhuman gymnast team "Body Up" was on the Dublin stage while Sinead O'Connor performed in Buenos Aires. The members of Body Up are each as strong as five women, with corresponding increase in dexterity. During the concert, Ms. O'Connor gained that same power - and there's evidence that every woman in both the Irish and Argentine audiences has the power also. The sorcerers have a theory. Last year, certain sorcerers had a Black Arts Competition. The sponsor of the winning entry was the Italian countess Symmetria San Giacomo. As her prize, she gets to influence world events this year. Her desire is apparently to increase the power of women, both individually and collectively. Our superhuman world already has some women with up to five times the strength of a man: the dancers of Body Up. They'd reportedly like to separate, but they get their powers from being together. They'd like to transfer those powers to other women, but haven't been able to yet. Symmetria is herself five times as strong as a man. She wants every woman to have that same power. So she sent a catalyst to Body Up. She won the Black Arts Competition, so every Black Arts mage on Earth was sworn not to interfere. Symmetria arranged for Wyatt Ferguson to assist. He has the motive (a former affiliation with Body Up) and the power (chaos magic). The ultimate chaos sorcerer is said to be Mary of Nazareth, a.k.a.the Mother of God. 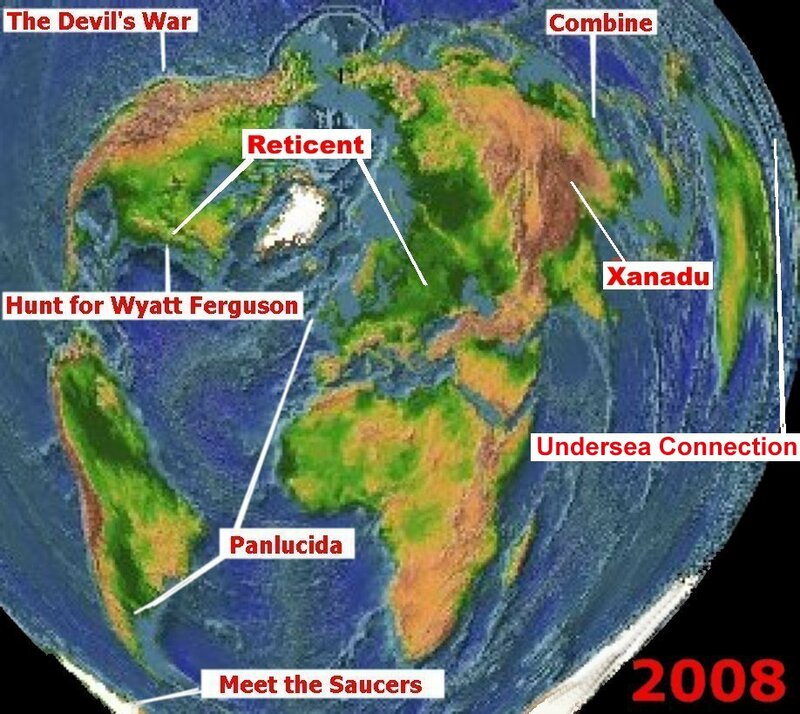 Wyatt Ferguson's records say, she's been roaming the Earth for seven years now. She's been subtly influenced to finally surface, at a Body Up show: the "Panlucida" worldwide concert. She passed the wards against evil magic, and served as the catalyst for a major act of sorcery. At the Dublin stage, all the women got the powers of the women around them, in a manner like Body Up. From now on, it is supposed any woman can get the Body Up powers from proximity to someone else who has them. Amazingly, Sinead O'Connor got the Body Up powers too, although she was in Argentina. Now the powers can be remote-controlled - at least at times of great shared involvement. The sorcerers I served with say, doing sorcery upon an unknowing recipient is extremely irresponsible, even if it supposedly is a benefit. This is an accusation of crime for Wyatt Ferguson and his criminal contacts to answer. The Hunt for Wyatt Ferguson begins. Through last year Mr. Ferguson was operating in Michigan. He and his compatriots organised their raid against Luftwaffe-Kanada from there, and conducted acts of civil disobedience thereafter. His compatriots are apparently religious extremists of some sort, affiliated with the American Baptist Conference. That organisation says, these operatives have migrated for mission work in an undisclosed location, under anonymity for their own safety. This alibi is barely feasible, if their mission is in an Islamic country. I hope while they evade authority there, they contemplate the relatively gentle discipline of Western democracy. Mr. Ferguson has likewise gone underground. Assuming him to require some form of revenue, and believing him obsessive-compulsive enough to "earn" it instead of taking donations from his criminal allies, I think it likely he will resurface in Massachusetts. He lived there twenty years. He has been employed at four different organisations there: Hyperion Systems; DuoPolarity of Boston; the Freedom Engineering Research Group; and the Asante-Ghana Trade Mission. His contacts at the latter three locations are recent within the last two years. They show some promise for investigation. The Hunt for Wyatt Ferguson gathers information. I chose to work my way outward from the airport: first DuoPolarity in Boston, then Asante-Ghana's mission house in Framingham, and finally Freedom Engineering in Douglas. My staff tells me, this is the Boston Marathon route, only in reverse and half again as long. To do my business this day, I allowed myself the joy of running it. With traffic interfering, super-speed is not such an advantage, but I met that challenge. At DuoPolarity I spoke with office-manager Ms. Karin Bodil. She denied any contact with Mr. Ferguson since last March. At that time her company had employed him for a space mission - which failed. For further missions they did not choose to employ him. They say he was loyal and capable, but I infer there were some personality or confidentiality issues with him. At Asante-Ghana's mission, the chief scientist Dr. Karla Melhor spoke with me. She and some Asante-Ghana staff have provided support to space missions alongside DuoPolarity, so she was able to confirm Ms. Bodil's story. She seemed sympathetic to Mr. Ferguson, though. Asante-Ghana employed him briefly in September 2006, in conjunction with their own surprising space program. At Freedom Engineering, Mr. Ferguson's relatives were not available, but the facility director Mr. Sureshkumar Prabatha met with me. He also denied contact since one year ago, when Mr. Ferguson assisted with a U.S. government contract. He mentioned, Mr. Ferguson has access to a small house in the hills south of town. I ran up to the house, put a camera unit nearby, and had my staff put the house under surveillance. Lodging was obtained at the FERG Hotel in Douglas, ironically founded by my target. Freedom Engineering keeps its headquarters there. Today's interviews indicate, Mr. Ferguson is indeed good at what he does, and also at building alliances to do it. He is amazingly loyal to his associates, when it suits his purpose; otherwise, he's nowhere to be found. This gives me some insight into his plots. Enemy action in the Hunt for Wyatt Ferguson. No action at the house overnight. In the morning, I obtained Freedom Engineering's permission to enter. There I intended to install a restraint device, should Mr. Ferguson enter. The interior of the house was covered with mold. My first thought was, I could rule out recent use of the house. But then the mold started moving! I knew it was likely more than mold. Superhumans throughout the world reported last year, an alien lifeform known as Fine Green Paste was spreading. If that was there, I had to move quickly. The door was blocked. Windows were covered with green. There was only one way out: up the chimney! Running would not help me climb a chimney. But I can move quickly anyway. And I am small enough to fit up most chimneys, at least those which lead to fireplaces. So I exited that way. There is one detail I did not know about modern chimneys: they are closed and topped with exhaust pipes! Fortunately I carry a pocket knife at all times. With that and super-speed I was able to force my exit. Analysts say, the house was not actually infested with Fine Green Paste. But still, some enemy agents had gone to some effort to make the house appear that way. Freedom Engineering denied involvement, but they couldn't account for the house key. I suspect Russian agents. After-action report in the Hunt for Wyatt Ferguson. Mr. Ferguson's other local contacts are through Hyperion Systems. That company reorganised several times through the 1990s, and finally went defunct in 2001. But my staff was able to locate one supervisor E. B. Henry of that company, whom I promptly contacted. Ms. Henry was starting a programming venture, from the back rooms of a shopping mall in Quincy-Massachusetts. Her circumstances were so reduced, she had to share quarters with a women's club potluck dinner. But she'd actually contacted Wyatt Ferguson, and was expecting him to arrive at her facility from Maine! I asked her to contact me if he did. But it seemed obvious to me, Mr. Ferguson knew he was being hunted, and could not be expected to walk into a trap in this location. The hunt for Wyatt Ferguson is showing diminishing results. I feel I shall have to abandon my patrols in Massachusetts and await another opportunity. My little loved one Katerina comes from Ukraine. She tells me, she has every reason not to want to go back. Her employment and her marriage allow her to stay in Germany. I provide both these things. Katerina and I depart on a Spanish cruise today, from Barcelona to Ibisa in the Balearic islands. One could travel so much faster, but I understand some people may not find that restful. Katerina, I take this time because I love you. To some extent, I can work from here, and read reports. But I cannot act. Only in fantasy can people run on water. Reports say, Wyatt Ferguson continues to build his villainous alliances. During the Panlucida incident he was reported in Epirus-Greece, as the guest and ally of the attractive Countess Symmetria San Giacomo. He now travels the world via cargo plane. Various reports have placed him in Newfoundland-Canada, Brasil, and Congo. I suspect some of these are false plants - but if any man could be three places at one time, that man would be Wyatt Ferguson. He does claim to have split into three bodies already, including that of the famous Powernaut (whom I should be investigating even now). Why not more? Epirus-Greece is half-warm but rainy this time of year. I imagine Mr. Ferguson must have been secluded inside the Countess's compound there. They both pursue physical fitness and train in the martial arts. One can only imagine the other ways in which they exercised together. I have self-discipline and avoid such release, even on vacation. Little Katerina is the ideal person to run my office while I take the field, but she is practically terrified of men. She even finds it difficult to be intimate with me. Katerina, I wait because I love you. The Hunt for Wyatt Ferguson is over. Though I am on vacation, I have not abandoned the hunt. I have hired the huntmaster Yon Schmidt to continue in my place. Today he reported success. Wyatt Ferguson has been cornered, at a women's club dinner in Newport-Rhode Island, USA. Tomorrow he will appear in U.S. federal court in Providence-Rhode Island, for extradition to Canada. I enjoyed dinner with my wife. Life is good this day. Is the true Wyatt Ferguson still out there somewhere? In the hallway at U.S. Federal court, Wyatt Ferguson stumbled. And disappeared. He reappeared a second later, stumbling a different way. Since then, he has not spoken. Some people think he injured himself. From what I know of his sorcerous powers, I disagree. I believe he has achieved some manner of body switch. I was still on a cruise in Spanish waters, but I knew I had to intervene. Fortunately I had a helicopter crew ready for such occasion. They hovered over the ship and pulled me up by cable. My fastest private plane was waiting to take me to North America. My Katerina, I apologise, but duty calls. On my way, I arranged for a responsible sorcerer to meet me. Vara Hosea herself took that assignment. The world knows her as a piano rock star, but she's one of the two leading responsible sorcerers on Earth, alongside Lucianus Autonomus. Ms. Hosea had already performed her own mystic examination of her patient. She judged him a soulless shell. She and I disagreed about whether the mental essence of Mr. Ferguson was justified to flee confinement, but she consented to help me track it. Apparently she has previous experience in this. Our next target was Mobile-Alabama, USA. An aviation facility there serves as the operational base of the Powernaut. Nearby is the home of his employee Karl Scribner - the last known extra-body host for Wyatt Ferguson. Mr. Scribner consented to meet us despite the late hour, because he had a story to tell. Mr. Ferguson had tried to inhabit him again! According to Mr. Scribner, his battle against mental possession was easily won: he simply said "No". Mr. Ferguson then departed peacefully. Ms. Hosea believes the psychic essence of Wyatt Ferguson may have travelled further, to seek a weaker mind. But she says the further travel will weaken him. I hope the travel will weaken him unto oblivion. Unfortunately, with this further step in the process, the sorceress declares herself unable to trace Mr. Ferguson's essence. I find myself unable to make her hurry to do what she says she cannot. Wyatt Ferguson has been weakened but is once again fugitive, in a way which governmental authorities cannot track. I once again appeal to the public to cooperate to make him answer the charges against him. All characters in this fiction and the phrase "Superhuman World 2008" are copyright © 2008 by Eiler Technical Enterprises. The map of the Superhuman World is based on one from Henry Bottomley's map software which is well worth a visit.